The actress Hilary Swank ties the knot with social entrepreneur Philip Schneider in a stunning yet intimate wedding location close to her California home. Alexandra Macon of Vogue detailed the joys for us. Hilary wore a white lace and embroidered dress by Ellie Saab Couture for her fairytale ceremony. Mariska Hargitay served as her maid of honour while fellow actor and Supernatural star Misha Collins were amongst the guests. Of the setting, most noteworthy, “It was timeless. There is just no other way to describe it.” explained Hilary. 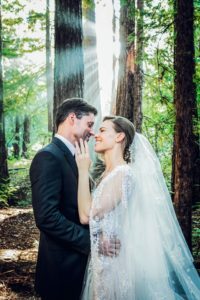 The couple said their vows in intimate redwood grove populated with trees that are over 800 years old. 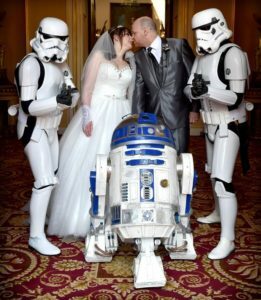 Usually there is one part of the couple to be with a fantasy to but we have heard of a wedding where both parties have a deep passion for all things Star Wars. 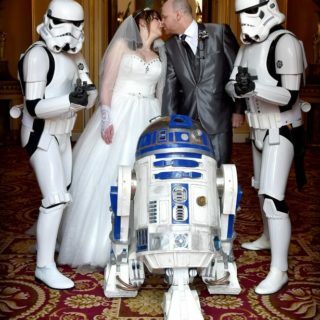 And thereoin was born a Star Wars themed wedding with R2 D2 and Storm Troopers Tom Belger of the Liverpool Echo reports. Every girl has their dream wedding. The theme, the motif, the colors has been set in their mind. And on each girl’s dream wedding, there is that hope that they can pull it off. Each one of us may have dreamt of a winter wedding. And some may have issues with how to bring it all together. 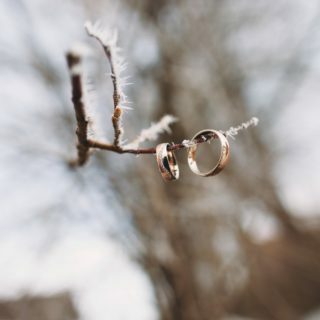 As we all know, winter is one of the hardest season to plan a wedding on. And we are here to help you. So we have listed some tips on how you can pull off that winter wedding dream. TIME – Winter usually brings in the clouds earlier than usual. So if you wanted to have lots of photos with natural light on it, planning your wedding earlier or in the morning time would be a good thing. WEDDING OUTFIT – If you want to walk in the snow to make the most out of your venue and theme, it may be best to look for a wedding outfit that would be comfortable for you. You can choose a long wedding dress then wear Uggs or Snow shoes underneath it. The guests would not even see it. TRANSPORTATION – Backup. 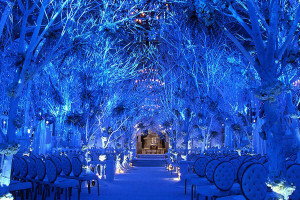 That is what you should ask your transportation company if you are planning a winter wedding. You would not want to get stuck in the snow and no other options to continue the journey to the venue. CANDLES AND LIGHTS – Make sure you incorporate candles and lanterns on your wedding design. 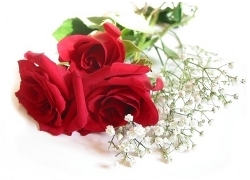 Not only would they make the venue more beautiful, they can also bring warmth to your guest. VENUE – Try to look for a venue that has a covered outdoor location. Or make sure there are enough umbrellas to go around should the snow starts to fall again. FOOD AND DRINKS – Opt for warm and hearty starters like soups. Also, you can make the most out of the seasonal ingredients by adding them on the menu. 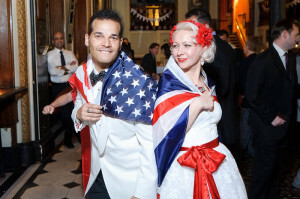 Different countries have different ways on how they celebrate and prepare for their wedding. This is because they have different sets of beliefs and traditions. And when we are looking for something to share with you guys, we have come across an interesting article. It is actually quite helpful for wedding planners and the like. The Grooms have a Bachelor’s Party prior to the wedding day The Brit’s have a ‘Stag do’. Many guests hit the dance floor in-between dinner courses. American wedding cakes are made of sponge and the tiers are usually stacked on top of one another. During the cake cutting ceremony, the newlyweds will hand feed each other a piece of cake. Sometimes, they will stuff the cake into each other’s faces! 😉 British wedding cakes are traditionally made of fruit cake and are displayed using pillars inbetween each tier. While this tradition is slowly fading out, many traditional weddings still order fruit cake, however, most couples now ask for stacked tiers. The American top table consists of the bridal party and is seated man/woman/man/woman, with the bride and groom in the middle, the best man next to the bride, and the maid of honour next to the groom. The British top table consists of parents and honour attendants. When looking at the table, the order from left to right is; Chief bridesmaid, groom’s father, bride’s mother, groom, bride, bride’s father, groom’s mother, best man. The first dance is typically held after the bride and groom are announced into the dining room. The first dance takes place after the cake cutting ceremony, which happens after the meal. An American bride tosses a bouquet into a crowd of bachelorettes, while the groom lifts up his bride’s gown to pull off a garter and fling it into a group of bachelors. Rumour has it that the woman/man who catches the bouquet/garter will be the next in line to get married! Something old, something new, something borrowed, something blue, and a six pence in her shoe. This last part of the ancient superstition is unique to the British. The Americans never caught on to that part! While the main aim is to choose flowers in a colour that you like, you’ll want to select flowers that fit in with the general colour scheme of your wedding. Think about the venues where you will be holding your ceremony and reception. If you love the idea of soft pink flowers but your venue has a scarlet patterned carpet, you might need to rethink your colour scheme. Also, if your venue is modern and minimalist, delicate country flowers in pastel shades could easily look out of place, while arrangements of striking white lilies would be ideal. Pure and clean, the traditional bridal colour, is a good catch-all colour for weddings as it contains all the colours of the spectrum and therefore all their qualities. It’s important to remember, however, that white wedding dresses come in a wide variety of shades; you want to make sure that the flowers that you choose will coordinate with your wedding dress so you should match it with a swatch. Full of energy; Symbolises beauty, courage, continuity and immortality; Attention grabbing and assertive. Raises the pulse rate – hence a passionate colour! 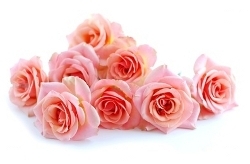 Feminine and non-threatening – think pink and you think of grace, gentility, and happiness. Pink blossoms convey youth, innocence, joy and love. 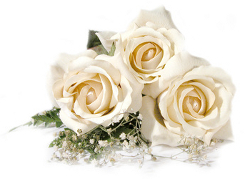 Calms the nerves; often associated with fragrance. Bright, sunny and cheerful – a symbol of friendship. Stimulates the memory – reminiscent of summer, sunshine and holidays. The colour yellow signifies new beginnings, happiness and success. 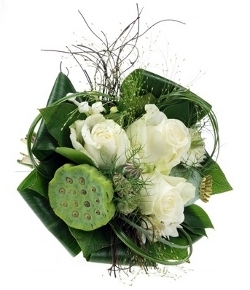 Synonymous with nature and ecology – the perfect complement to any other bloom. Green represents health, resilience, good fortune and youth. Green flowers and foliage provide a perfect relaxing background while, at the same time, expressing joy and optimism. Pale blue hues calm worries and preoccupation – representing peace, openness, and serenity. Fresh floral arrangements filled with blue flowers offer a cooling antidote to anxiousness. Restful, calming, and cool. Relaxes the mind – like the sky and the sea. Dramatic, flamboyant, unusual and mystical. The colour of royalty, representing refinement, grace, and elegance. Flowers are often cheaper if you choose blooms that are in season around the time of your wedding, so it’s worth looking at one or more of the following varieties, depending on your wedding date. Blossoming springtime flowers signify the onset of the summer months. Golden Daffodils and pastel shaded Tulips add a dash of colour to proceedings in early Spring. Azaleas and Cherry Blossom give a hint of Summer as temperatures rise towards the end of the season. 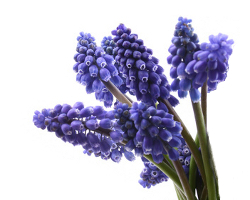 Other Springtime flowers include: Freesia, Hyacinth, Lilac Magnolia and Muscari. Summer is a time of abundance for flowers, with all colours and shapes available. Sweet Pea – Lilac and Carnations are all appealing, while Lavender will add magnificent fragrance to your bouquets and reception tables. Golden yellow, orange and deep red are all popular for flowers. Berries – Foliage – seedpods and twigs or, almost, anything natural, works well for table centrepieces. Exotic flowers such as Orchids give contemporary autumn weddings a touch of drama, while traditional brides should consider Hydrangea and Pinks. 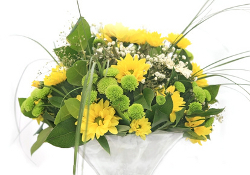 Autumn flowers to consider include: Chrysanthemum, Euphorbia, Gerbera and Hypericum. Wintertime and short, dark days need not be an obstacle to a successful floral theme. As well as the many ‘all-year round’ varieties available also consider the ‘early-bulb’ flowers such as Amaryllis – Hyacinth – Tulip – Narcissus and Hellebore. Flowers from the Southern hemisphere, such as Protea, Kangaroo Paw Anigozanthos and foliages including Ilex (Holly Berry) and Leucadendron can be employed to add much-needed colour. Natural colours tend to be darker with rich reds and purples a firm favourite for winter brides, although, if you want to move away from dark shades, white is a good alternative with its echoes of snow and ice. Many flowers and foliages are now available all year round. This may mean that at certain times of year they cost a little more, as they have been grown with added heat and light, or flown in from far countries. However it also means we get a huge choice of fresh products right through the year. 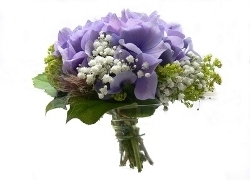 Favourites include : Chrysanthemum, Delphinium, Freesia, Carnation, Gypsophila, Iris and Roses.